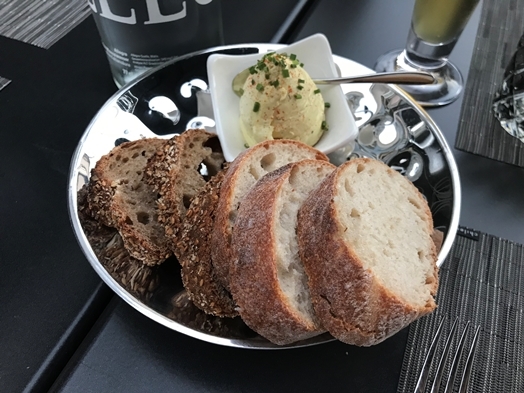 It is almost 10 years ago since I’ve last been to the Restaurant Heugümper – and I must say it is a place I will probably visit more frequently going forward. You get to sit outside and enjoy a nice warm evening (if the weather is right). Some bread with spread is served rather quickly so you’re not starving while picking what to eat. 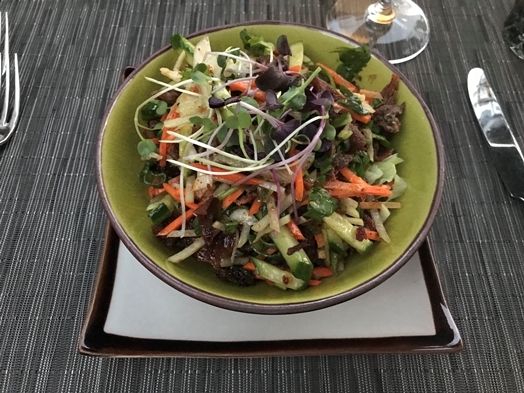 As a starter, I went for the “spicy Thai cripsy duck salad” (CHF 22.00) which was admittedly delicious – but it was also way too much. I’m not sure how they position this as a starter – but it would definitely serve as a main course. Or at least as 3/4 of a main course. The dishes are generally more on the spicy side (as we were informed, the chef is married to a Thai and likes the spiciness of it) but – at least for me – still acceptably spicy. 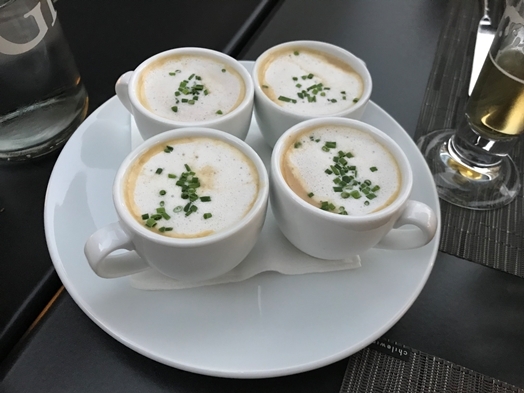 As a little course in between, an “apple fennel soup” was served to be tried. I liked it and it was perfect to clean the palate of the spiciness of the previous dish. 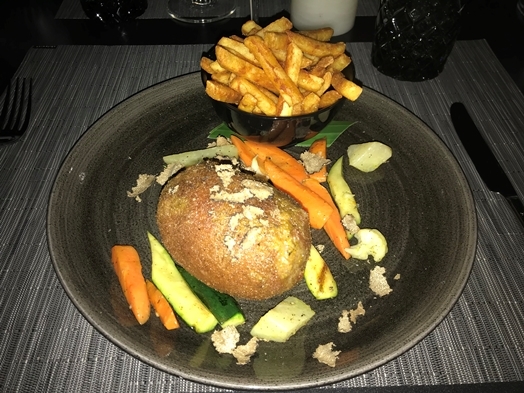 As a main I went for the “veal cordon bleu filled with truffle brie, ham, and served with seasonal vegetables and French fries” (CHF 49.00) which was one the one hand side delicious and secondly the cordon bleu which was super full with cheese – like I’ve never seen before in my life. Truly incredibly! But, it was definitely too much after that rather large ‘starter’. The prices are more on the ‘Zurich side’ – quite expensive but at least the place is nice, the service is friendly (Marco really goes the extra mile) and you, in the end, know what you pay for. Beverages are quite okay with CHF 9.50 for a liter of sparkling water or CHF 9.00 for a glass of “Grüner Veltliner”. The “double espresso” with only CHF 5.50 is actually to be considered cheap for Zurich standards. A bottle of Terra accounts for CHF 94.00. Definitely worth visiting again, and no need to book a table in advance. There were plenty of tables empty.